Azure Resource Manager is the preferred management framework for services in Azure. Azure Load Balancer can be managed using Azure Resource Manager-based APIs and tools. Front-end IP configuration – a Load balancer can include one or more frontend IP addresses, otherwise known as a virtual IPs (VIPs). These IP addresses serve as ingress for the traffic. Back-end address pool – these are IP addresses associated with the virtual machine Network Interface Card (NIC) to which load is distributed. Load balancing rules – a rule property maps a given frontend IP and port combination to a set of back-end IP addresses and port combination. A single load balancer can have multiple load balancing rules. Each rule is a combination of a frontend IP and port and back-end IP and port associated with VMs. Probes – probes enable you to keep track of the health of VM instances. If a health probe fails, the VM instance is taken out of rotation automatically. 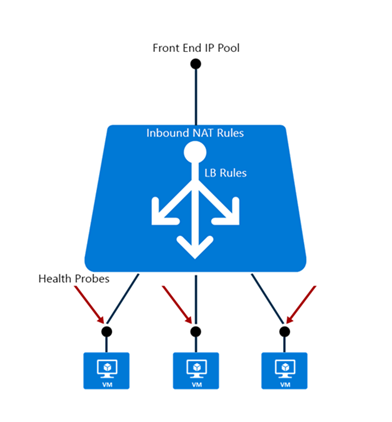 Inbound NAT rules – NAT rules defining the inbound traffic flowing through the frontend IP and distributed to the back-end IP. Templates can include definitions for Virtual Machines, Virtual Networks, Availability Sets, Network Interfaces (NICs), Storage Accounts, Load Balancers, Network Security Groups, and Public IPs. With templates, you can create everything you need for a complex application. The template file can be checked into content management system for version control and collaboration. For Quickstart templates using Azure Load Balancer, see the GitHub repository that hosts a set of community generated templates. Azure Networking Cmdlets can be used to create a Load Balancer. You can also get started creating an Internet facing load balancer and configure what type of distribution mode for a specific load balancer network traffic behavior. Learn how to manage idle TCP timeout settings for a load balancer. This is important when your application needs to keep connections alive for servers behind a load balancer.